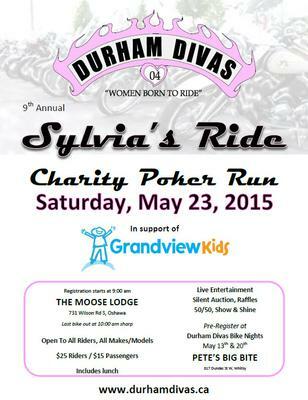 The Durham Divas (a women's motorcycle riding group based in the Region of Durham) are holding the 9th Annual Sylvia's Ride on Saturday, May 23, 2015. Sylvia’s Ride is a motorcycle charity poker run held each year in memory of our founding President Sylvia Spice. Sylvia was actively involved in the Durham Region community and had a strong belief in giving to others – we hold this ride to honour her. The ride will start and finish at the Moose Lodge, 731 Wilson Rd S, Oshawa. It is approximately 120 km with 4 poker stops along the way with the final stop at the Moose Lodge. The ride itself promises beautiful scenery mixed with lots of twists and turns. Pre-registrations will take place at our Bike Nights on Wednesday, May 13th and 20th from 6:30pm – 8:00pm at Pete’s Big Bite, 817 Dundas Street West, Whitby. Registration on May 23rd will be from 9-9:45am with the last bike out at 10:00 am sharp. This ride is OPEN TO EVERYONE, all makes and models of bikes.